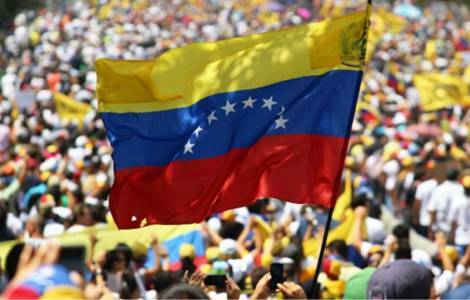 AMERICA/VENEZUELA - The Bishops "It is urgent to listen to the popular cry of change"
Caracas (Agenzia Fides) - "January 23, 1958 is a historical date for all Venezuelans, an inspiring sign of the triumph of social rationality in the face of the abuse of power, of the unity of the weak people before the dismantling of a regime of abuse, corruption and repression that hid all the evils that an authoritarian government can have", thus begins the message of the Episcopal Conference of Venezuela (CEV) on the occasion of the national holiday, sent to Fides. On January 23, 61 years ago, the popular uprising ended the dictatorship of Perez Jiménez and marked the return of democracy in the country. "Today we meet again with another January 23", the Bishops write, who continue: "Faced with this reality that we have described as a national tragedy, people are asking for a change that includes a period of transition to elect new national authorities. Therefore, it is urgent to listen to the popular cry of change". The message thus describes the current situation of the country: "The marches organized for this 23 January, throughout the national territory, are a sign of hope, something new that is starting to be generated in our country. We Venezuelans cannot be mere spectators of what happens in the country". Then the request: "We urge, as citizens, the national armed forces and the various security organs of the state, to protect the population". Finally, the Bishops call for reflection and prayer: "January 23 must also be a day of reflection and prayer. We are believers and devoted people. We ask the Blessed Virgin of Coromoto, patron of Venezuela, to take care of every Venezuelan, of families, in their search for well-being and freedom". The message, dated 22 January, is signed by Mgr. José Luis Azuaje Ayala, Archbishop of Maracaibo and President of CEV, together with the Bishops.